For the past 2 days I have been unraveling all my research material on Renz's products in order to put together a time line on his bitters products. I believe I have put together some pretty good evidence to distinguish when his three mould variants of his bitters bottles were put into use. The first written evidence of Dr. Renz's Herb Bitters for public use comes from an article where Dr. Carl M. Renz (John's father) of Sacramento "exhibits a case of herb bitters of his manufacture, claimed to be an excellent article for diseases of the blood, spasms of the stomach, ague, scarlet fever, colic, etc." at the State Fair on September 16th, 1867. The first advertisement for Dr. Renz's Herb Bitters appears on October 4th, 1867, by Dr. C. M. Renz & Son. This ad was slightly revised on October 17th to include J. Leuze as the first S. F. agent and now had J. Renz, Proprietor [his father would no longer be listed on ads, except as reference to]. John Renz would advertise Dr. Renz's Herb Bitters continuously from this second ad until June 1880 without interuption, using 41 different ads in Sacramento, San Francisco & Oakland newspapers for 14 years. One particular advertisement for Renz's bitters 1 year anniversary, states that Dr. Renz's Herb Bitters was introduced to California on September 1st, 1867. John Renz started his Paints, Oil, Glass busines in 1863 and continued to advertise his trade thru October 1867 when his advertisements stopped [although he continued in this business until it sold in 1871] and he began advertising his father's bitters product. J. Renz exhibits his bitters in the 1868 State Fair but loses the First Premium Award to Dr. Henley's Wild Grape Root IXL Bitters. However Renz's Herb Bitters takes the First Premium Award (Medal) at the 1869 State Fair and again takes the First Premium Award at the 1870 State Fair. On September 5th, 1870, John Renz places his first advertisement to sell his business, this ad runs for 1 month, see figure 1. 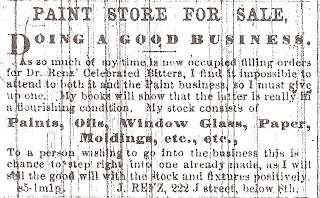 On October 5th, 1870, John Renz places another advertisement to sell his business, see figure 2. 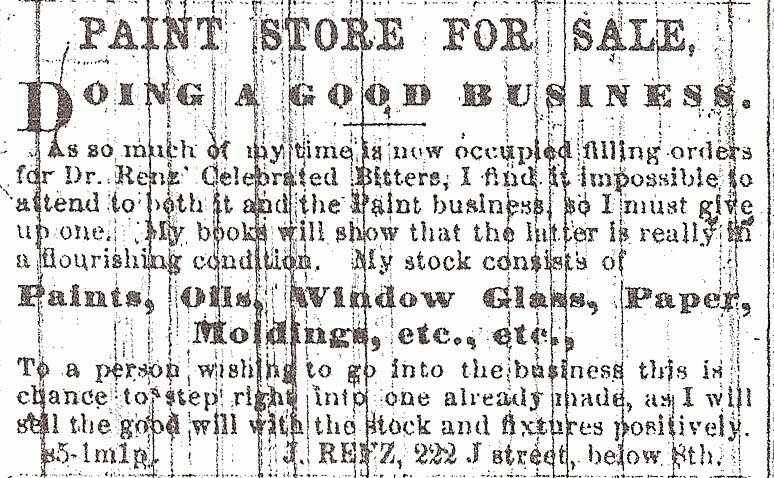 Again on February 1st, 1871, John Renz places an ad to sell his business, see figure 3. An advertisement on October 12th, 1871 shows that Renz has re-located to San Francisco and his bitters depot is at 221 Sacramento St, S. F. see figure 4. When the small lettered embossed bottle was made precisely is unknown and by which glassworks precisely is unknown. However this particular bottle (mould) variant shares some unique features which are seen on the Cassin,s Grape Brandy Bitters  and the Alex Von Humboldts Stomach Bitters  of which both of these bottle moulds were made for SFGW by a pattern & machine shop in SF. This particular bottle mould has 3 distinct patches made to the mould, and bottles of this mould have been seen without embossing, indicating that the glassworks may have sold to Renz a used mould that was then engraved for his embossing at a reduced price [as new moulds made here were more expensive than moulds from Pittsburg mold makers] which had the majority of the US bottle market. 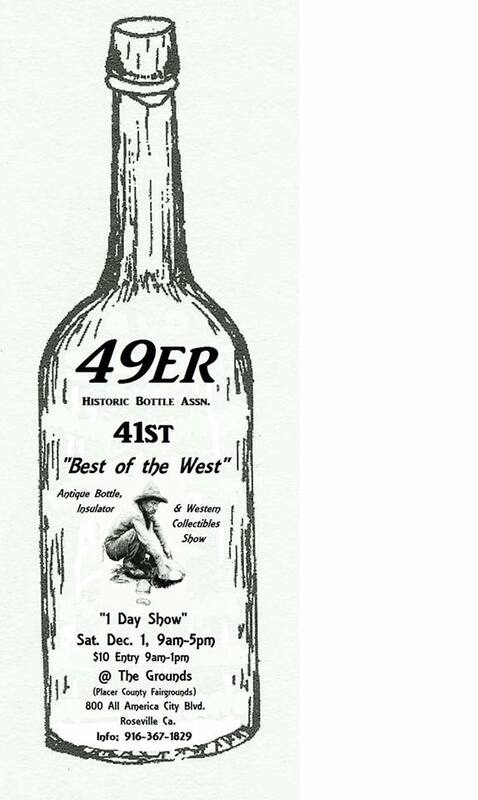 The large lettered embossed bottle variant have been found with both Sacramento and San Francisco labels. The straight legged letter R variant bottle is most likely a PGW made bottle, it shares the same style font as the Dr. Wonser's U.S.A. Indian Root Bitters bottle [including apostrophe style] which was advertised and marketed beginning June 1870 thru 1872. An advertisement for Renz's bitters shows this bottle and lettering style in an 1873 ad. The large lettered embossed bottle with curved legged letter R is seen with a SF label only and is most likely a SF & PGW made bottle, with Renz's Blackberry Brandy product being marketed in 1875 and his Bonanza Bourbon product both made with a stylized letter R font as well. With the merger of the SFGW & PGW glass factories in August of 1875 this bottle is most likely a product of the combined company. Some collectors have seen a tooled top example of the embossed Dr. Renz's Herb Bitters, this seems logical since most likely Renz continued to market his embossed bottle up to his last advertisements in 1880. John Renz married Wilhelmina in 1870. They had a son in 1871, and had a daughter in 1872, who died in 1874. John Renz advertised a saloon for sale in 1892 which was successfully run for the last 15 years. John Renz died in March 1897. Trying to determine which glassworks produce the Renz's Bitters is difficult, one of the influencing factors was San Francisco Glass Works period of time that they were in non-operation due to their disasterous fire, [the factory ruins were purchased by PGW]. The private moulds were owned by the customer and this mould may have been salvaged and used by PGW. SFGW was not operating from July 24th, 1868 thru September 11th, 1870. That's 780 days or 2 yrs & almost 2 mos. I also examined 2 photographs that I have, one of PGW in 1869 and one of SFGW in 1874. There are examples of square bottles in both, however even with magnification it is difficult to identify any of these as a Dr. Renz's Herb Bitters. We just acquired this aqua colored base embossed OGW , Oakland Glass Works, Oakland, California demijohn. The first I have seen in aqua. We now have three, light pink, amber and aqua. I consider these to be the " Holy Grail " of Western demijohns.